REID SMITH JOKES, THAT YOUNG ARCHITECTS often get their “big break” when they design a home for their parents. In the case of this small, simple and utterly breathtaking cabin on Swan Lake in northern Montana, Smith’s break was more a break-away. 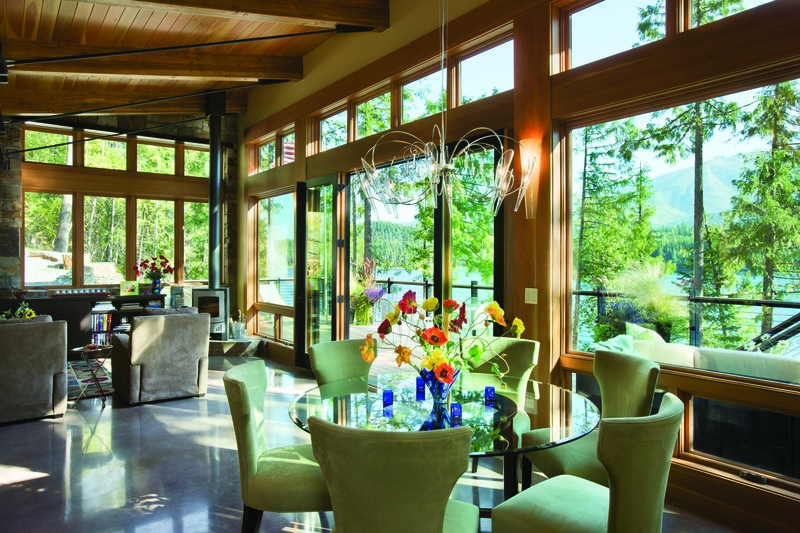 Smith, principal of Reid Smith Architects since 2003, was already well-known for his expansive, mountain-top gems across the state, including several in the Yellowstone Club. 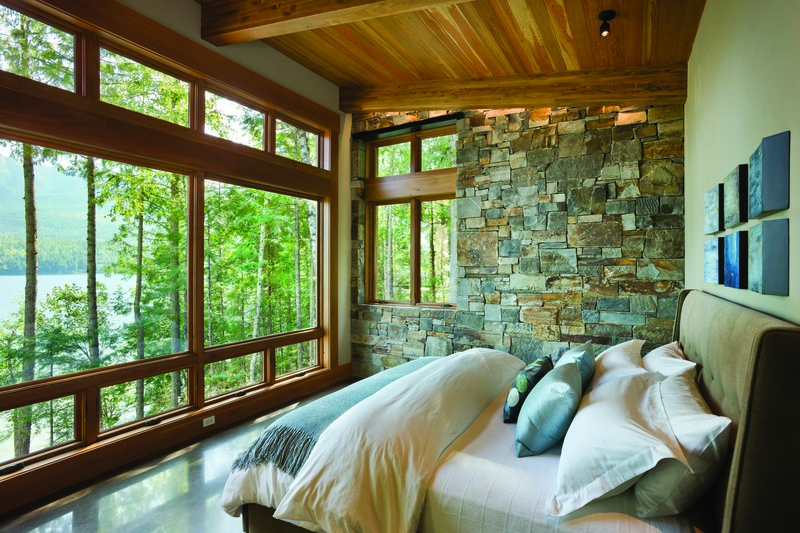 Though each project reflected the homeowner instead of the architect — from 12,000-square-foot lodges surrounded by nothing but peaks and sky, to smaller, cozier getaways tucked into the trees — each one incorporated timeless mountain vernacular and utilized local materials. 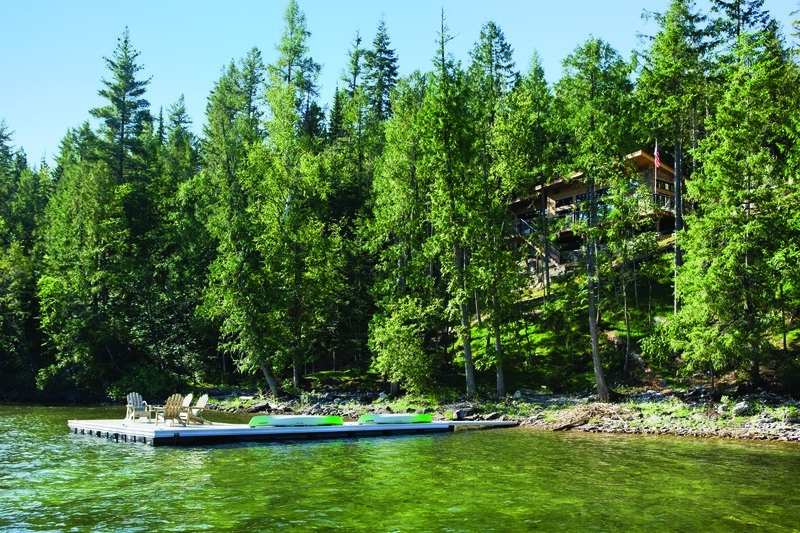 When Smith agreed to design his parents’ lakefront retreat, he formulated what they wanted with the challenges of the site and came up with a fresh approach to Montana architecture that is part contemporary lake house, part rustic cabin in the woods, and entirely enchanting in its form-follows-function simplicity. Calling it a transitional project for the firm, Smith says that the end result is proof that their approach to problem solving works. “This was our first opportunity to take a different perspective on Montana architecture,” Smith explains of the project that was completed in 2009. 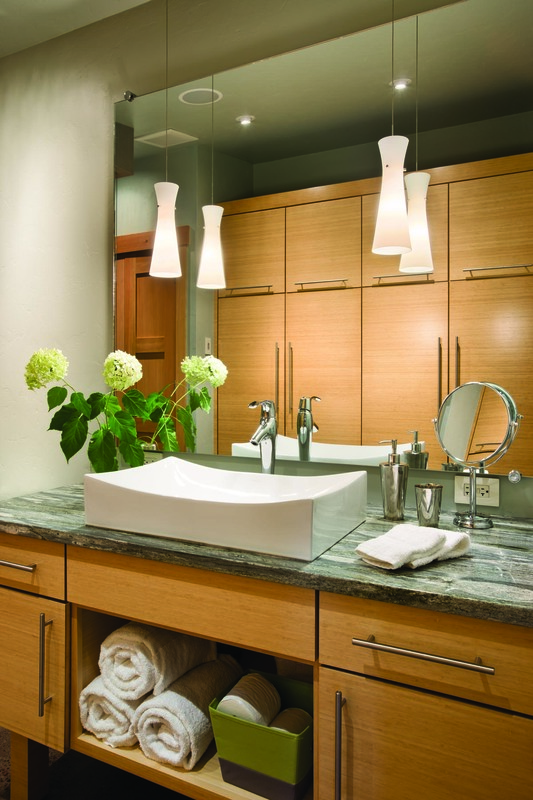 But that perspective came from the same rigorous process Smith’s firm undertakes on every project. Smith started by listening to his vivid description of what they wanted. They kept saying they wanted a cabin in Montana, which implies something fairly rustic, the architect explains. But in the next breath, they would describe walls of glass and a wide-open, airy feel, an image that stood in stark contrast to the classic cabin, he says. 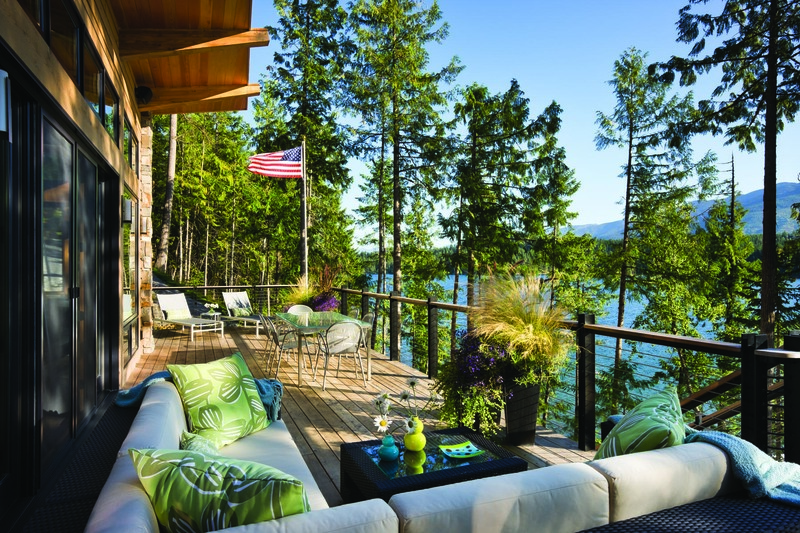 Figuring out the building site on the heavily forested, waterfront lot set the design in motion. A relatively level bench on the top of the lot, as opposed to the steeply inclined hillside nearer the water, was the obvious choice, but Smith kept revisiting his parents’ concept of wide-open space. “If you put the house on the hillside, you’re blocking the natural entrance sequence and creating a barrier to the lake,” he says. In addition, the architect thought about functionality and the importance of having easy access to the house from the lake. “We wanted to reduce the distance between the lake level and the house level … because kids have to have sandwiches every 15 minutes,” laughs the seasoned father of two young girls. Solving that problem drove the design. “If we tucked it right at the top of the slope, we’d preserve that openness … and we’d reduce the distance to the lake.” By integrating the home into the hillside, Smith could give the house a lower profile from the water, create a sense of privacy in the trees, and make use of such energy-efficient benefits as a slab-on-grade floor. 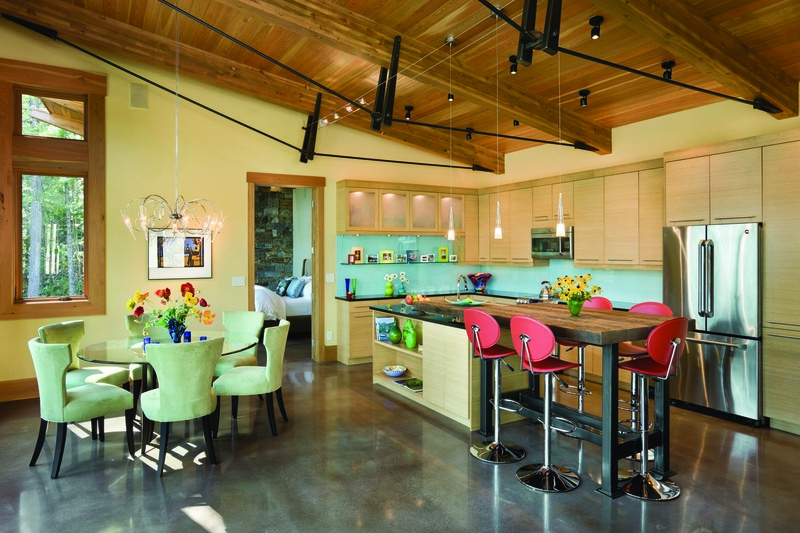 Smith used traditional materials — local ledgestone and fir — in an unconventional way. He built natural stone walls as bookends to anchor the house and tie it to the hillside. That also allowed him to create a simple roof form that is unobtrusive from the lake but maximizes the height for the wall of windows that runs the entire length of the one-bedroom cabin. 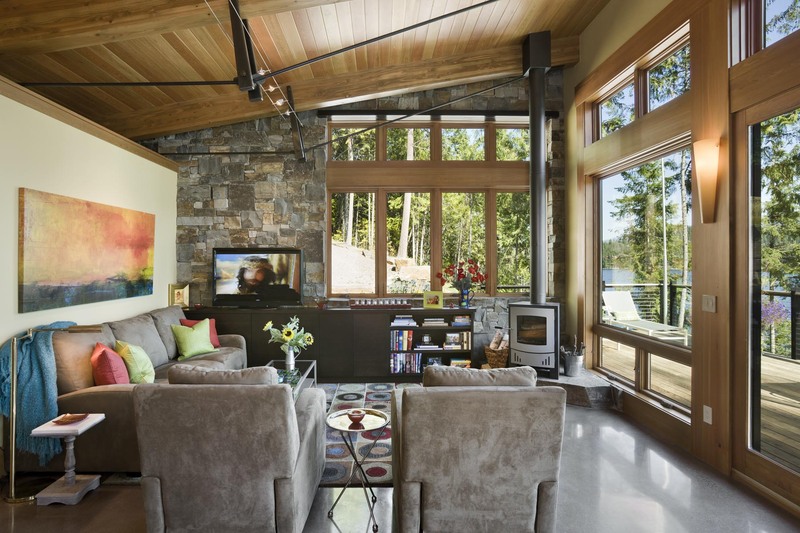 The result is a contemporary cabin with clean lines, simple materials and walls of glass that flood every inch with sky, forest and lake views, all of which were important to Smith’s clients. “The minimalistic design evolved more from the necessity to preserve the views than a contemporary style,” Smith says. Schlauch echoes Smith’s take on the beauty of the simplicity. “This cabin was a really simple form that, at the end of the day, worked,” he says. Though the project was among both firms’ smallest, the experience was outsized for the entire team. “What’s fun about this place is that we get to live it and experience it,” Smith says. And Schlauch, who owns the cabin two doors down, stops by regularly. “The team that put it together is the team that’s using it,” Smith says. 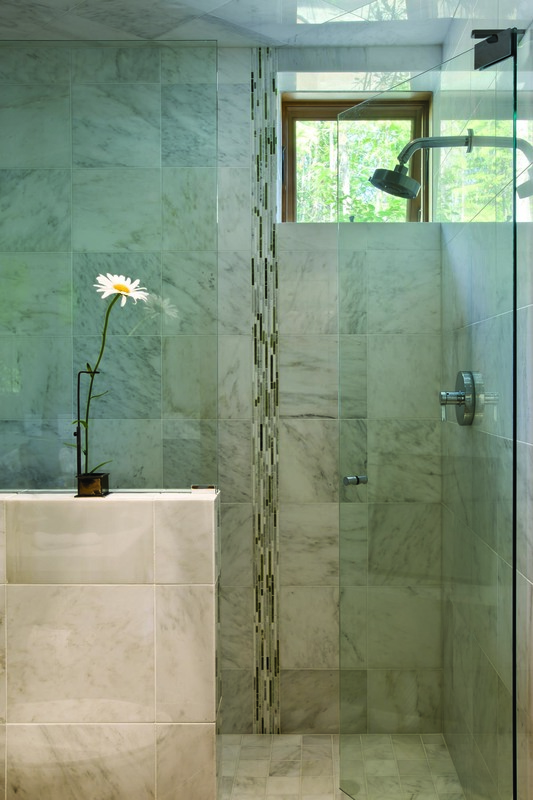 Because of their durability and water resistance, concrete floors were a natural choice for the entire cabin, and the slab-on-grade construction keeps them cool even on the hottest days. Schlauch Bottcher Construction ground down the concrete so that the aggregate is exposed, a detail that ties the floor further to the cabin’s lakefront setting. Reid Smith Architecture is proud that the structure’s modesty reduced the home’s profile and preserved the trees surrounding the house in order to maintain the coziness of the property. In the kitchen, bamboo cabinets keep the space light and fresh while a painted glass backsplash counterbalances the blue of lake and sky. The owner designed all of the interiors for the cabin in an effort to maximize the home’s relationship to the lake, forest and sky. Keeping a simple interior color palette with clean-lined furnishings helped enhance the airiness of this small lakeside retreat. Less than 1,200 square feet in total, this humble but oh-so-airy cabin has an open kitchen, dining and living area, a powder room and master suite.